Venkata Shanmukha Kumar Kandimalla is currently pursuing his IMB (International Master in Business) degree at SDA Bocconi Asia Center, India. He holds a Bachelor’s of Engineering degree in Electronics and Communication Engineering from KLUniversity (Andhra Pradesh, India), where he studied from 2011-2015. Shanmukha had a work experience of 32 months as Application Development Analyst. During his stint, he was responsible for deployments in Production, Test and CT environments and monitored the performance of the application including on-line and batch processes for different projects for the organization. He also handled support and maintenance and service for the shakedown activities. 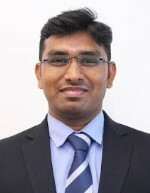 To see Mr. Shanmukha’s more detailed CV, click here. Share the post "Venkata Shanmukha Kumar Kandimalla"